New to the Controller pane is the Transform tool. 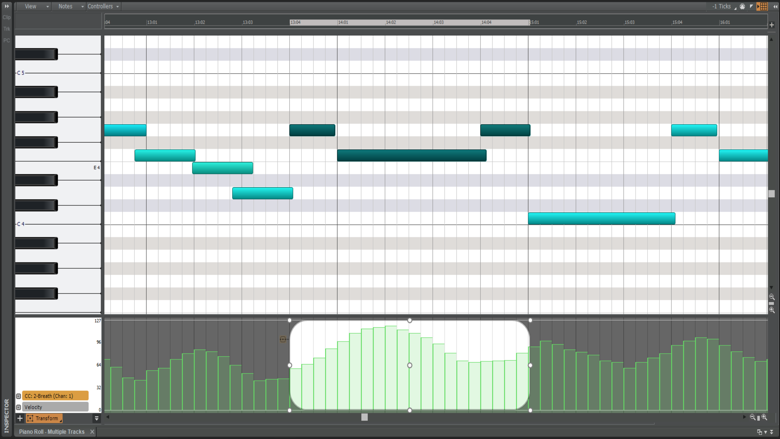 The Transform tool provides a new and unique way to edit in the Controller pane, by allowing for easy sculpting and manipulating of data. It has 2 main modes, Hard (Default) and Soft. These each control the way it interacts with nearby data. While the Hard mode provides crisp and precise edits, the Soft mode blends new changes with other nearby data. This is similar to how 2 audio clips can crossfade between each other. With its Mask mode, users get improved redrawing of data but only in the area of the mask. This makes redrawing only a specific section incredibly easy when paired with the Soft mode. Additionally, the Transform tool also has the ability to follow note selections with the “Auto-Focus” and Auto-Focus Monophonic modes. Now you can simply select the CC data you want to work with by selecting the associated notes. MP3 export is now available in SONAR Artist, Professional, and Platinum at no charge. Recently the patent royalties associated with MP3 encoding expired. Cakewalk is excited to offer MP3 encoding free of charge in SONAR.